is a song that comes to my mind when someone mentions Tea. And I hummed this in my head as I walked into Lloyds tea House in Gopalapuram that Thursday evening. Located near DAV school, Lloyds is probably the only café other than CCD on that stretch. It also brought back memories of the old Amethyst [used to be on the road perpendicular to Lloyds] And ever since my 1st visit to Infinitea in Bangalore, I kept wishing for a similar place to open in Chennai. As you walk in, the decor and the colour on the walls is what hits you first. Very soothing turquoise/cyan colour on the walls, a small section with sofas covered with map upholstery and a book shelf to separate the sections. There are shelves at the far end of the cafe with a few artefacts, some of which are absolutely adorable and chic. There is a small counter in the middle with a display showcasing the wide variety of desserts they offer,a long with a few trays with Scones, biscotti and the pound cake. The shelves all around are filled with black containers with labels on them. Only when I went up close did I discover they all held different kinds of tea in it. 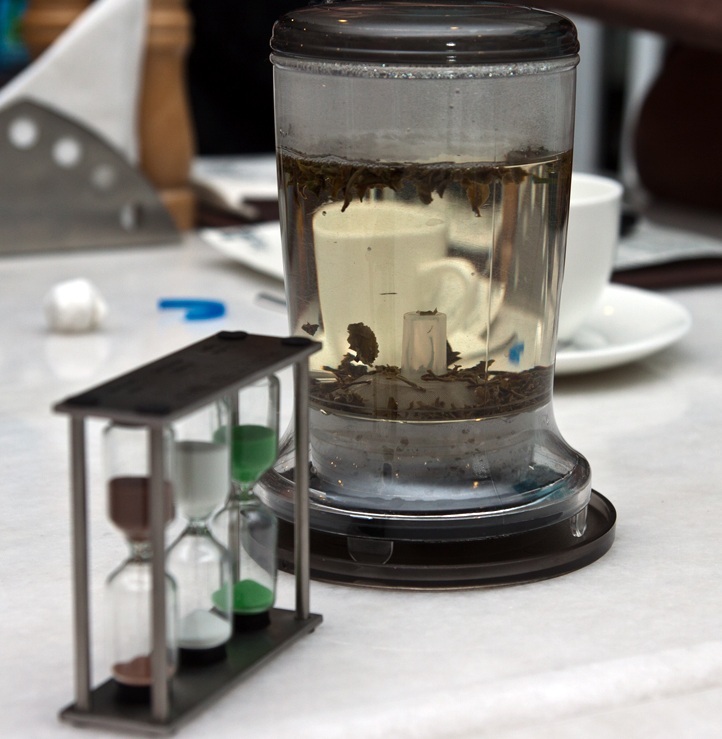 They have over 60 kinds of Tea. Yes, you read it right! There were a few who opted for the cold iced teas, but personally I preferred the hot ones. 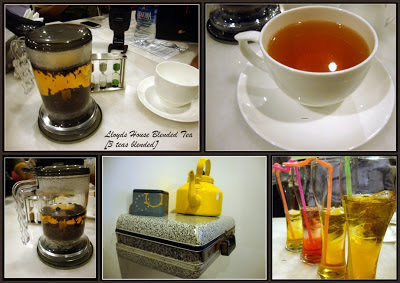 We tried the Blended tea, Irish tea, and so many others [my head is buzzing with names and flavours]. Their menu does not end here. They offer quite an array of eats as well, ranging from finger food to main dishes. While we waited for the food, a few of us quietly occupied the sofas and thanks to the TV on the wall, were enjoying the cricket match. For the vegetarians, there are quite a few options and I say this with a big broad smile. 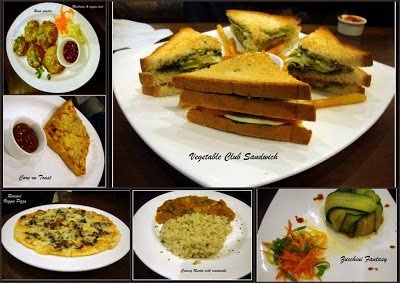 There are club sandwiches, pasta, risotto, pizza, and the curious Zucchini fantasy[the dish was a drama on its own, you unfold the zucchini sheets to find a mix of veggies cooked Italian style inside].. There was also the Rosti platter, mini tartlets if you will call them that and ofcourse the corn on toast as well. The risotto was interesting- it was served alongside Thai red curry. Italy meets Thailand, and they were quite happy together!! Ah, now we were all smiling and happy. Just in time for the grand finale, drumroll please. 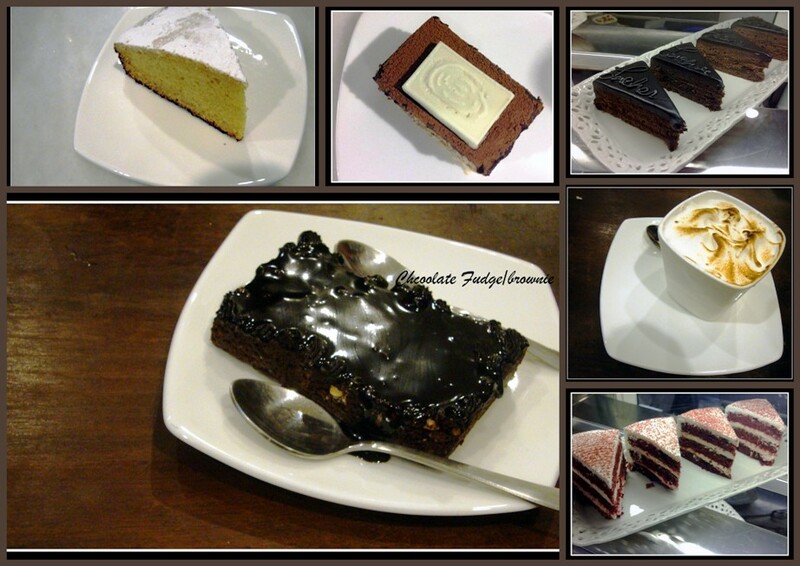 We are now making our way towards the desserts sections, the place has 1,2,3,4, 5..... and many more desserts. There are fudge brownies, pound cake, red velvet cake, chocolate truffle, and then some more. Feast for your eyes and for the growling tummies..
Next time you want to grab a quick bite or go somewhere interesting, make a beeline to Gopalapuram and head to Lloyds. What more? They have valet parking as well~!